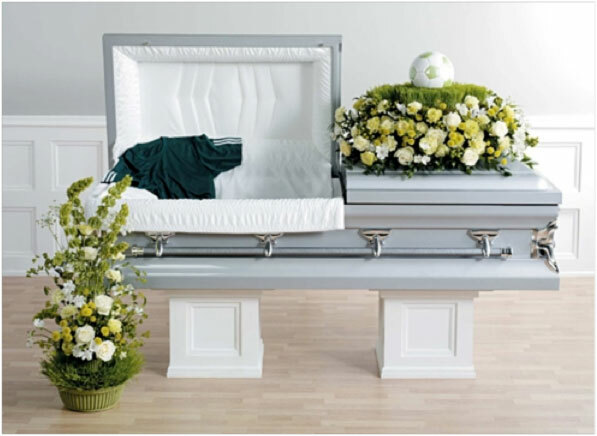 Many funeral directors and those on the periphery of the industry claim that the personalization trend is the brainchild of the 'baby boomer' generation. Considering that includes me, at 54, I have to say this: we do want things our own way. We want to live our lives in our own way – normally a way significantly different from those of our parents – and we want our deaths to be equally as individual. It's common to read news stories about unique "send-off" ceremonies: the ashes of Hunter Thompson being shot from a cannon being just one example. The rise of Star Trek funeral products and the proliferation of personalization products and services available through funeral homes are just two hallmarks of a social trend which is taking hold around the country. When you consider the 'traditional' funeral: you most likely imagine a standardized ritual (often religious) service where friends and family gather together to honor the life of a loved one, and mourn their passing; and then an interment in a burial ground. The church or funeral home chapel is seen, in the mind's eye, full of floral tributes which look something like the one to the right, and below. 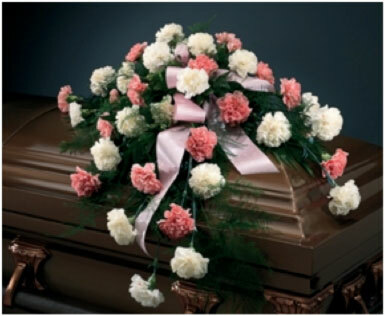 While the flowers themselves are beautiful, and no doubt fragrant, the arrangements "say" nothing about the deceased. Despite that fact, their calming presence for the guests would be profound. Each truly is lovely in its own right (I especially love the casket spray); however none can be considered "personal" or "unique." Chances are the funeral in the church down the way has similar tribute flowers surrounding the casket. A personalized funeral service, commonly referred to these days as a celebration of life, would not be standard, would not be commonplace. The ritual would be less formal, and you could go so far as to say the ritual has become less important than the person it is being held for – the deceased has, in a sense, become the star of the show. In the past there would be a "memory board" of photographs prominently displayed. Recently the "tribute video" has become a staple of personalized services: a video compilation of family photos set to music, shown as a back drop to the event. Theme based print keepsakes, such as bookmarks, or memorial folders can now be personalized with photos of the deceased. The themes express their hobbies or personal interests – and many times the theme of the print materials is coordinated to the theme of the video tribute. But, where do the flowers 'of old,' those traditional floral tributes seen so clearly in the mind's eye, fit into this more personal celebration? Without doubt, the arrangement and placement of flowers around the dead is humankind's oldest tribute, the oldest form of memorialization; the oldest act of mourning. We can go back 62,000 years, to a cave burial in Northern Iraq, where we'll find that a body was carefully placed on a bed of branches, leaves and flowers. You can turn to the entombment of the "boy king" Tutankhamen in Egypt, where his sarcophagus was festooned with floral tributes. 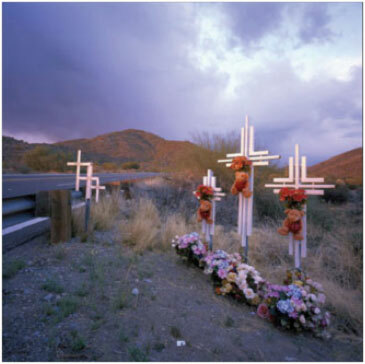 And, much more recently, what do we commonly see at roadside memorials, or the spontaneous memorials created after public tragedies? Flowers. Consider this roadside tribute. Experts have found that flowers play a significant role in the grieving process. Candince Shoemaker and Diane Relf in their 1990 study, The Role of Flowers and Plants in the Bereavement Process, substantiated the value of flowers and plants during this experience in people's lives. Shoemaker and Relf found more than half of the bereaved surveyed strongly agreed that flowers were a critical component of the funeral ritual that helped them deal with their grief. The study further demonstrated that because of their soothing qualities, sympathy flowers displayed at funerals actually had a positive impact on the emotional well-being of the bereaved. But despite their findings, and despite the fact that studies tell us that flowers make the process more manageable and inject some degree of pleasure, the presence of flowers at and around funerals is actually diminishing. The trend to request memorial donations to charitable institutions may lessen the burden on funeral directors, but it does little to mitigate the grief of those left behind when death occurs. Clay Atchison, owner of McAdams Floral in Victoria, Texas and webmaster for www.inlieuofflowers.info, offers his wisdom gained from extensive experience. "We know that flowers provide a voice for the many people who have difficulty finding the right words of consolation and support during a time of tragedy. 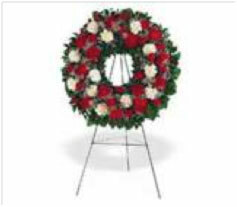 Flowers are a tangible means of showing concern, affection and sympathy for the bereaved." At the funeral service, flowers also help brighten a somber environment and provide a topic of conversation and a tranquil focal point. "After the funeral service, flower arrangements brighten the home and comfort the family, while flowering and foliage plants can serve as a living memorial to the deceased," Atchison added. How can we take the best of the traditional, and blend it with the new? Let's face it, with a 62,000 year-old history of floral tributes upon the death of a community member, the tradition we're trying to re-invent, is a long-standing one – which tells us that it's of value, and worth retaining in some form. We no longer need to have the same types of floral tributes as our parents and grandparents. We are the boomer generation – and we can do it 'our way,' with style. Consider the beauty of this eye-catching floral frame (right). The sunny yellow of the Button dasies, carnations and roses, combined with the overall elegance of the frame perfectly suit the vintage photograph of the man being honored. It speaks to a central character of order and organization; yet also addresses the abundance of life itself, in the cascading leaves and flowers. 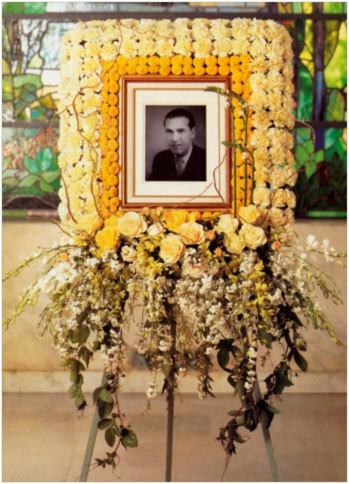 It's a truly appropriate floral tribute to a man who lived a rich, full life. Florists have found unique ways to weave personality of person and flower together, capturing the vibrancy of both in color, texture, and form. 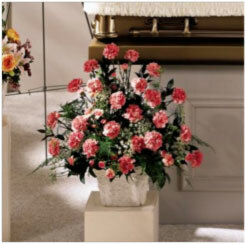 Consider this floral tribute to an avid racing fan – it captures the excitement felt on race day, doesn't it?